The next MX-5 Miata is only a few months away. Will it look something like this? Although it first debuted in 1989, the Mazda MX-5 is still only in its third generation. For a model this old, it&apos;s remarkable how Mazda has managed to slowly evolve their best-selling roadster over the years. Discipline was required. They were careful about adding weight as well as increasing its overall dimensions. Thing is, both happened and there have been several Mazda engineers over the years who&apos;ve been concerned about it. 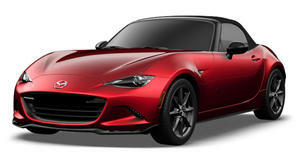 In other words, Mazda believes their current generation MX-5 is too big and too heavy. So what to do? Downsize. In the coming months Mazda will reveal the fourth generation MX-5 Miata and, as they&apos;ve repeatedly said, it will be smaller and lighter than ever. The goal is to bring the car back down to its original 1989 weight of just over 2,000 lbs. It will likely feature a small SkyActiv four-pot mated to the essential six-speed manual. Exterior styling will reflect their current design language which has just debuted on the CX-5 crossover (it&apos;ll also soon expand to the rest of the model lineup). Thanks to graphic artist Theophilus Chin, we&apos;ve been giving what we think are the most accurate renderings of the new car we&apos;ve seen so far. It&apos;s clearly smaller than the third-gen model and the front-end is definitely in line with the CX-5&apos;s. So what do you think? If the next MX-5 looks something like this will it continue to be the best-selling sports car it&apos;s always been?